Lanvin might be going through a lot of convulsions, between changing owners, and chopping and changing women’s designers. 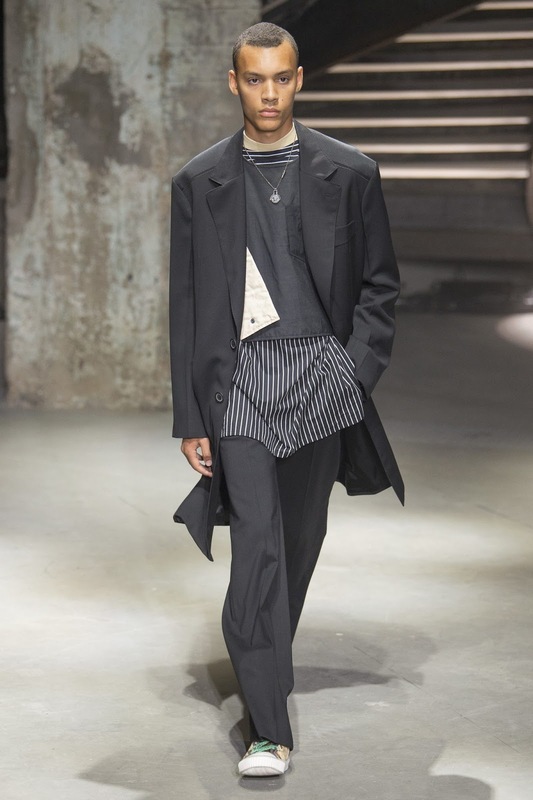 But that does not seem to have much affected the creative director of menswear, Lucas Ossendrijver, who presented a novel and very contemporary collection on a crisp Sunday morning in Paris. All based on the idea of contrasts – hard and soft; flat and 3D; back and front – this was an inventive fashion statement. Much of it faintly unfinished. “I started with the idea of bits of fabrics between the inside and outside. So, you can blow up the garment in new proportions,” explained the designer, in the lower depths of the Palais de Tokyo basement. Hence, many looks hung away from the body with a cleverly sculptural tailoring. His best ideas were often reversible, like some great Indian Brahmin long blue cotton shirts that had knitted blue jersey backs; or the flat green mackintosh with patched blue pockets. “I also tried to take out all the sewing; and all the hard work!” smiled Ossendrijver. The result were some great sweaters – not stitched up on one side, and cut slightly on the bias to hang at a discreet angle. Ossendrijver added an outdoors touch – a big trend here in Paris – with multiple boxy pockets, placing them on hunting vests and even at the knee of trousers. And sent out mini puffer vests though finished like splash jackets. Ossendrijver remains a great colorist – weaving together violet, fiery red, lime and pearly gray; and working in a techy new pale gray Lanvin logo, seen on some of the largest totes ever seen on a men’s catwalk. Multifunctional fashion, where the boundaries blur between different garments, so things manage to be both casual and formal at the same time. Call it "Healthy Hybridization". However, whoever had the absurd idea of staging the finale in near total darkness needs to take several Aspirin. Watching a cast almost walk into each other was frankly pointless – a final contrast too many.